Large, unsightly manifestations of algae have been prevalent across the surface of the Georgica Pond during the past week. The algae seemed to intensify as the temperatures have warmed. This year, there have been reports of algae in Georgica Pond that are green, yellow, brown, at the surface in front of their home one day but gone the next and then reappearing once again. What are these algae and how are they moving? Last year the algae was identified via DNA testing as Cladaphora vagabunda, a globally distributed algae known for its ability to form dense ‘bloom’ in regions over-enriched in nutrients. Despite all the different shapes, sizes, colors, and locations of algae in Georgica Pond this year, all signs suggest this is all Cladophora. Cladaphora exist and grows at the bottom of Georgica Pond where they attach to the bottom by means of a structure called a holdfast. Beneath the surface, the algae can range in color from brownish to bright green. As it grows upward and reaches the surface, it can begin to bleach by the sun at which point it turns a yellowish color and as it begins to die, and can turn brown or even black. Once at the surface, the algae can break loose from the holdfast and then be transported by winds. For example, on Thursday, a front moved through (recall the two low humidity days on Thursday and Friday) and shifted the typical mild, south winds to stronger north winds (gusts up to 25 MPH). This event pushed much of the surface algae accumulated on the east bank of Georgica Pond to the west side (note geographically, Georgica Pond does not sit north-south but rather northwest-southeast). Our recent survey show the macroalgae covering much of the bottom of the Pond (see graphic below), meaning it has the potential to re-grow to the surface again in regions from which is has broken off from. 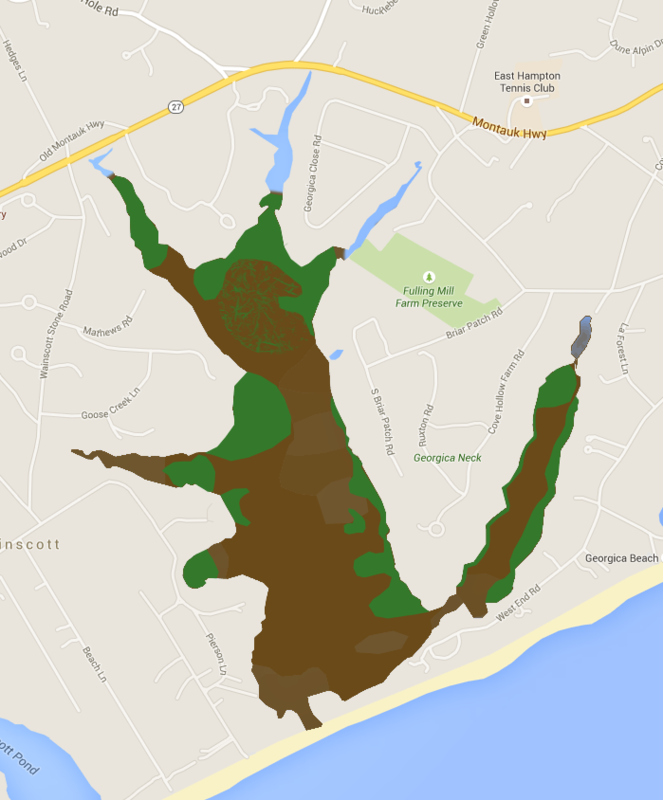 Importantly, the Gobler Lab has initiated conversations with the NYSDEC and East Hampton Town Trustees aimed toward developing a comprehensive plan to remove these macroalgae on a regular basis for the purpose of both aesthetics and nutrient mitigation. This will be discussed further at the August 1st presentation.